Twelve months since my last post, but I can say that I was busy piecing! Limeberry Tart is made with 14301 half inch hexagons. From the time I started designing it to finished and dropped off at its first show was exactly 25 months. So every spare hour for the last two years has been spent on her. All the hexagons were thread basted, I found I could do this in the car as a passenger, on the numerous road trips we took to visit our two new grandsons. I calculate, that on average, I spent almost three hours everyday for those 762 days working on her. Some days were more others day nothing! At her first show I was very fortunate to win a ribbon. 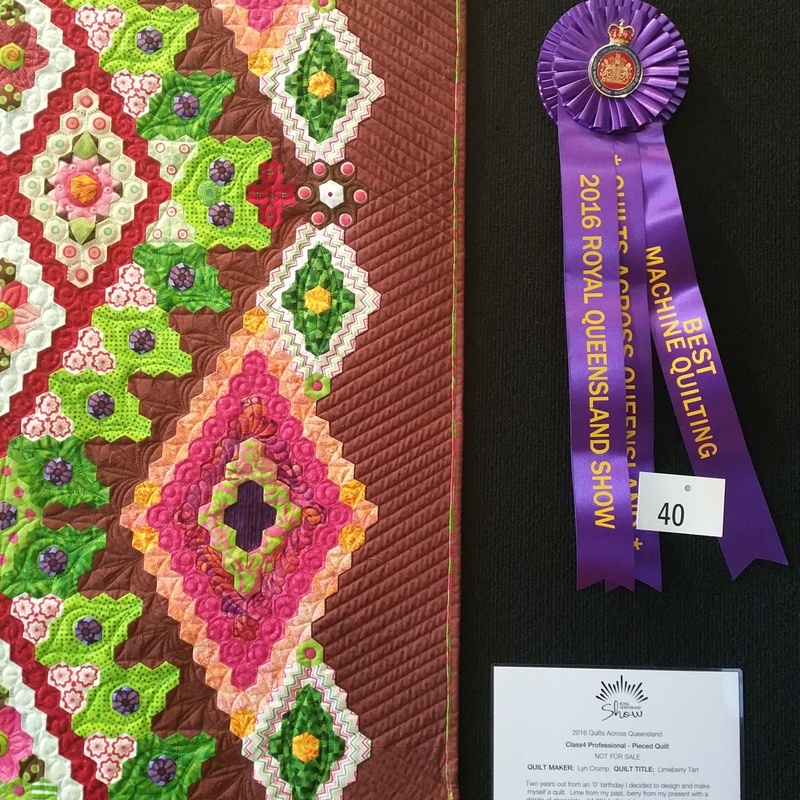 I entered it in the "Quilts Across Queensland" competition in the 2016 Royal Queensland Show (EKKA as the locals call it). It was awarded the Best Machine Quilting Rosette. Last week she was hanging in the Toowoomba Quilter Club Inc Show during the Toowoomba Carnival of Flowers and I know she was admired by many visitors. Next week it will hang in the Queensland Quilters Inc. 2016 Show and I have been informed it has won an award there as well. Fingers crossed for her journey and I hope all the attendees enjoy viewing her.